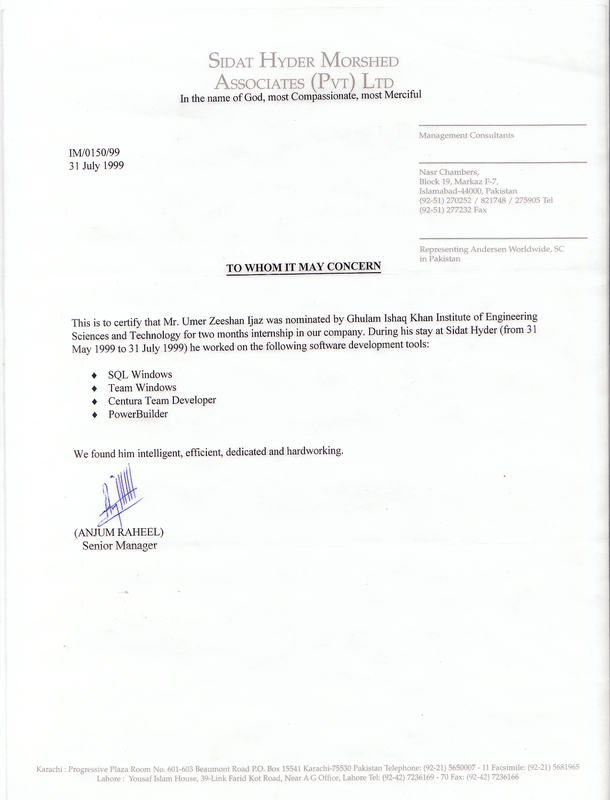 I lead the Environmental 'Omics Lab in Infrastructure & Environment Division, School of Engineering that I established soon after I was awarded the NERC Omics Fellowship back in November, 2014. The purpose of my research is to integrate different sources of 'omics data (metagenomics, metatranscriptomics, metabolomics, and metaproteomics) in environmental science for microbial community analysis. I regularly work on projects where we want to understand the taxonomic and functional diversity of microbial community in the context of metadata often recorded under specific hypotheses. Integrating these datasets require a fair deal of multivariate statistical analysis for which I have shared the code on this website. Those who are new to metagenomics may find my online tutorials listed under Bioinformatics useful. Since 2016, I am trying to expand my research to engineering projects that now include: Raman spectroscopy enabled microfluidics; a hardware system for integrating liquid handling, incubation and sensing; and development of artificial intestinal Salmon gut system through bioreactors. 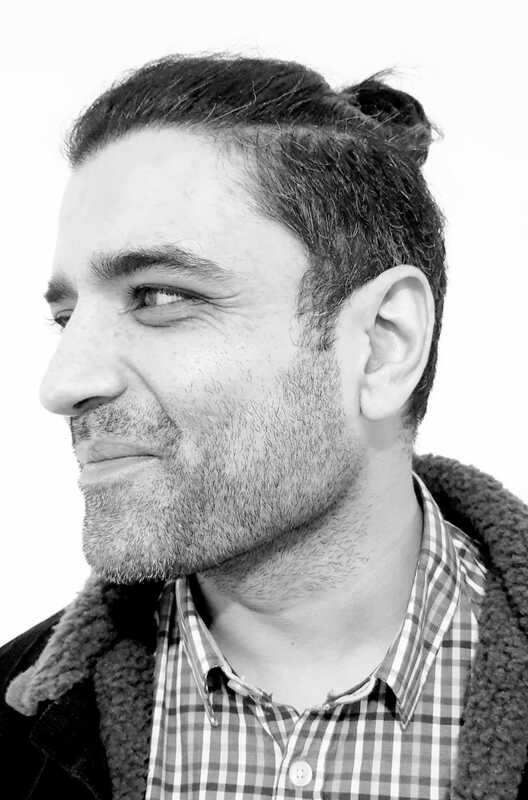 My long-term research vision is to develop specialised and bespoke systems (both hardware and software) that can exploit and harness the power of microbial communities (also including statistical tools), and to place Glasgow at the helm of excellence in innovative cutting-edge bioengineering solutions. When I am not very busy, I tend to support visiting PDRAs/PhD students in my lab. If you think you have an exciting project that aligns with my research goals, and if there are any mobility/travel schemes that can enable you to visit me, I'd be more than happy to support you in them. Past visitors are listed here. This project represents an unprecedented industry-wide collaboration of all major salmon producers in Scotland and other key industry stakeholders and academic partners to tackle gill disease that poses a significant challenge to salmon aquaculture globally. It is associated with reduced performance and elevated mortality on affected sites, and can result in difficulties in maintaining effective sea lice control. 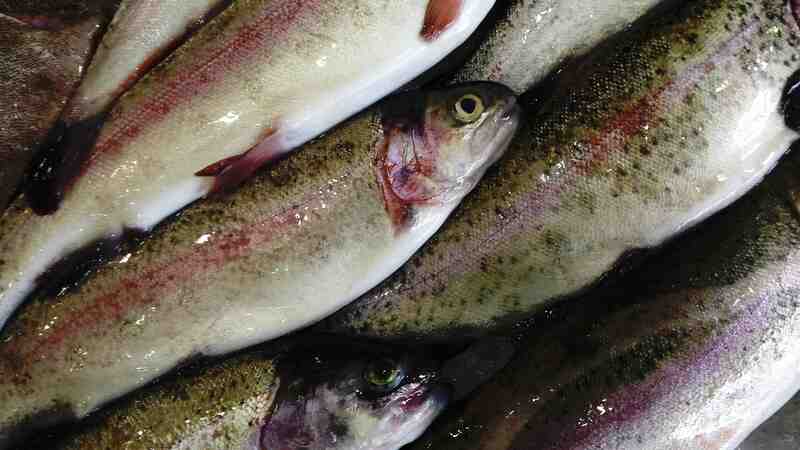 Since the emergence of a form of gill disease (amoebic gill disease, or AGD) in Scotland in 2011, multifactorial gill conditions, often termed complex gill disease (CGD), have emerged as an even greater challenge. Several pathogens have been implicated in cases of CGD, but our ability to detect them has surpassed our understanding of their clinical significance. Furthermore, the importance of other potential contributors to CGD (for example, environmental factors and management practices) is poorly characterised, and effective means of disease mitigation or prevention remain to be determined. Therefore, the overarching objective of this project is to identify actions and measures that can be used to prevent, reduce, or treat gill disease in farmed salmon by: characterising cases of CGD to develop a consistent definition of the disease; improving our understanding of the factors that drive gill disease via epidemiologic studies; creating evidence-based information and decision support regarding gill disease and fish husbandry; providing knowledge on the gill microbiome, exploring its role in the molecular pathology of gill health, and assessing how it changes under different conditions; and assessing the efficacy of potential treatments for gill disease via treatment trials. 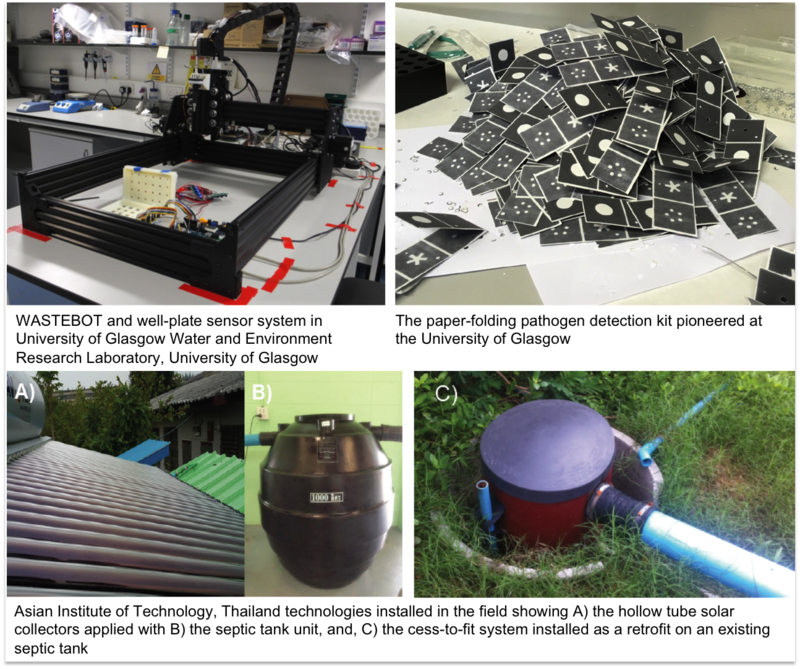 In this project, we aim to innovate biotechnologies enabling low-cost, sustainable decentralised wastewater treatment by characterizing, understanding and ultimately managing the complex microbial communities that underpin treatment in systems innovated by the Asian Institute of Technology in Thailand. To do this we will establish the biological limits of operation of these systems, identify biological predictors of failure in the system and establish robust and effective means of mitigating failure in the field. The research draws on novel application of statistics, bioinformatics, molecular microbial ecology, robotics and machine learning, and low-cost pathogen detection technologies. The overall aim of this project is to establish the microbial basis for different energetic phenotypes in Atlantic salmon. In doing so, we will establish the role of microbiota in influencing host performance, growth and energy economy (energetic phenotype). We will establish the link between salmon energetic phenotype and microbiome diversity a) in a population of wild juvenile salmon that will express natural variation in both traits; and in laboratory-reared fish in simulated aquaculture conditions at the b) freshwater and c) marine life stages. We will also establish the role for intestinal microbiota in driving maladaptive energetic phenotypes in farmed salmon escaped or released into the wild using: a) domesticated farmed fish and b) captive-bred wild fish. Finally, we will establish the basis for microbial energetic differences using ex-vivo and transplantation approaches via a) development of an artificial salmon microbiome system to validate microbial energetic profiles we find in fresh and saltwater settings, and b) transplantation of ex-vivo microbiota into salmon, sequence-based evaluation of transplantation success and energetic phenotype follow-up. Marine Harvest : University of Glasgow - Artificial Fish Gut Project Launched, December 2, 2016. 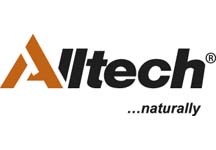 Artificial Fish Gut Project Launched, December 6, 2016. Researchers Launch Artificial Salmon Gut Project, December 6, 2016. How do fish eat healthily? Scottish scientists launch new salmon diet research, December 6, 2016. The overarching goal of this research is to develop an enabling technology to investigate the influence of environmental factors on microbial communities by linking physiological activities of individual micro-organisms with community diversity and function. 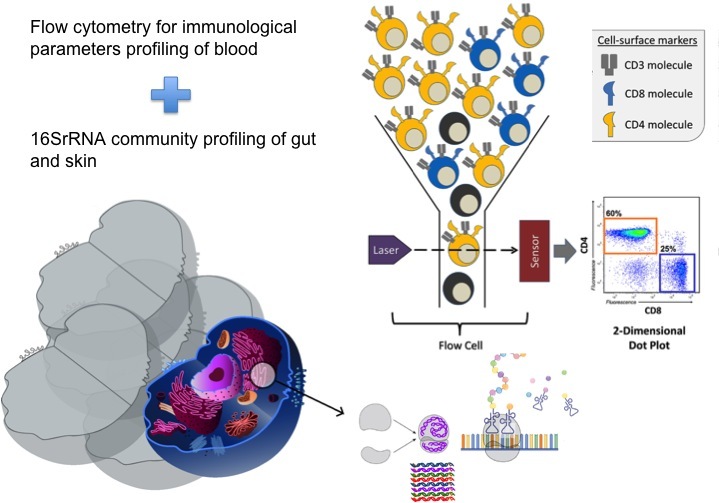 To achieve this, we will combine advances in Resonance Raman Activated Cell Sorting and Stable Isotope Probing for rapid screening and sorting of a community, based upon a quantitative measure of specific physiological activities of individual cells. Metagenomic analyses of these functionally sorted cells will further identify the species in each category. As a proof of concept, we aim to develop this technology by interrogating the effect of ocean acidification on marine primary production. Interactions between the Microbiome, Immunophenotype and Genome in PsA (IMIGPA) (2016-2018). Arthritis Research UK - Microbiome Pathfinder Award. This research project aims to test whether bacteria living on the skin or in the gut predispose to the risk of developing psoriatic arthritis (PsA) or influence response to treatment in patients with PsA. 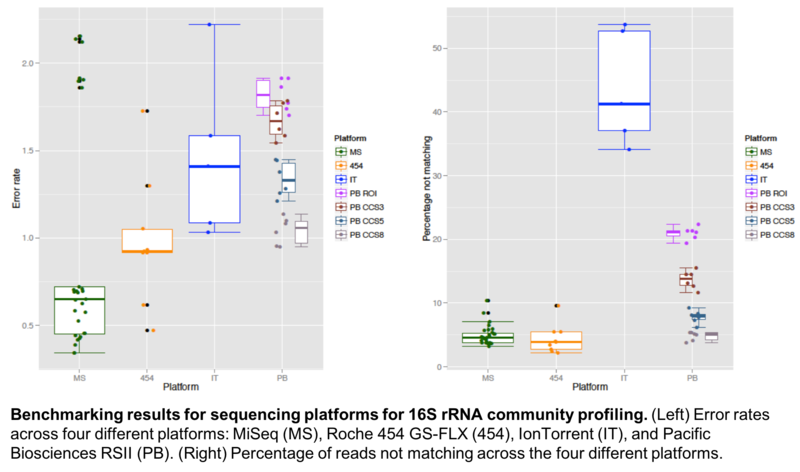 We will analyse the bacterial communities from the skin and stool samples of patients with PsA, both before and after therapy, and investigate whether the bacterial community composition correlates with the genetic make-up of patients or the immune cells they carry. Molecular epidemiology of Clostridium difficile in Scotland: developing novel, clinically applicable research methods to combine genomic analysis with health informatics (Mar 2014-Aug 2015). Scottish Infection Research Network/Chief Scientist Office. Clostridium difficile remains the major cause of antibiotic associated diarrheal disease, especially for the elderly. Whilst acquisition of the infection continues to be linked to healthcare facilities, increasing numbers of patients are infected in the community. Further, changes to antibiotic prescribing have affected the prevalence of specific ribotypes of the organism. We aim to characterise the molecular epidemiology of C. difficile in community and hospital associated strains in Scotland, especially ribotype 078, now the most common strain in Scottish hospitals. In particular we are developing bioinformatics tools and protocols that will ultimately allow evaluation of the genomic content of clinical strains in real-time. Additionally, we aim to develop a unique electronic resource for C. difficile research in Scotland that will link patient health data and C. difficile whole genome sequencing. The purpose of my fellowship research is to integrate different sources of 'omics data in environmental science for microbial community analysis. The computational based comparative analysis of DNA sequences may provide information about genome structure, gene function, metabolic and regulatory pathways and how microbial genomes evolve. However, to fully delineate microbial activity and its response to environmental factors, it is necessary to include all levels of gene products, mRNA, protein, metabolites, as well as their interactions. I propose to use large-scale whole genome metagenomic sequencing for assessment of taxonomic and functional diversity of microbial communities. The data generated by metagenomic experiments are both enormous and inherently noisy, containing fragmented DNA sequences representing as many as thousands of microbial species. 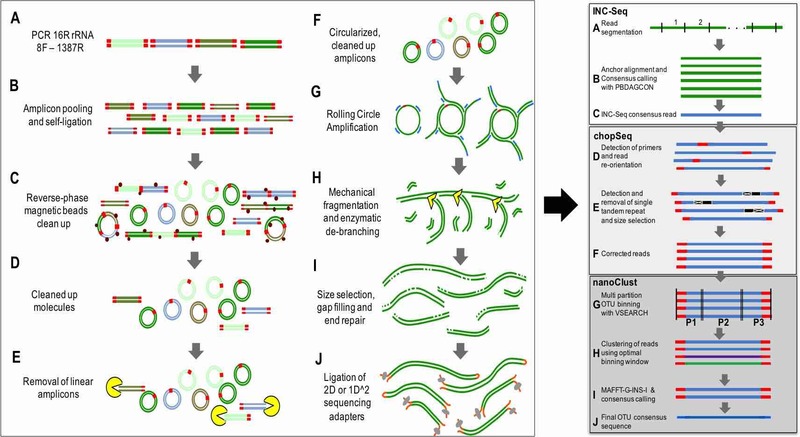 After using pre-filtering steps, including removal of redundant, low quality sequences, the short DNA sequences are assembled together into longer contigs of overlapping reads, and these contigs may then be scaffolded into full genomes in a bottom-up approach. Having obtained the assembled contigs, the obvious next step is to use publically available databases to annotate the coding regions in these contigs. This will tell us WHAT functionality is available and provide information on WHO is there, the metagenomic sequences are binned, i.e., by associating a particular sequence with an organism. This can be done by either searching for phylogenetic markers or by looking for similar sequences in existing public databases. The end result is the community profile of different samples in terms of organismal abundances within each sample. Whilst metagenomic analysis gives a profile of the microbial community at a specific place or time, and their potential functional, it does not reveal which genes are actually being transcribed. 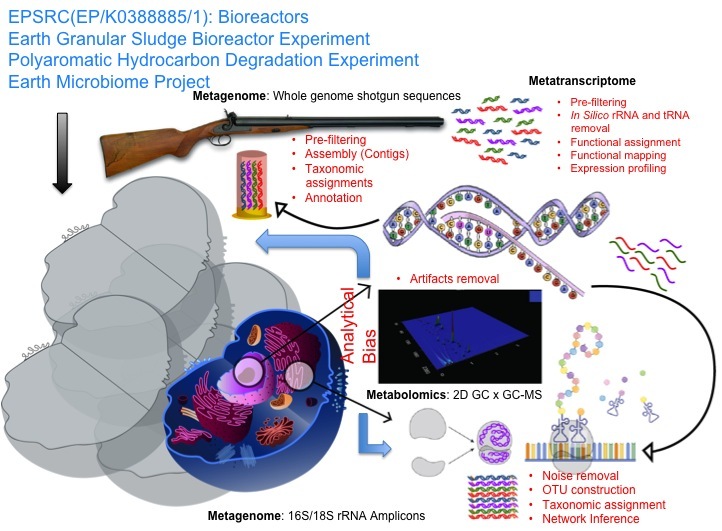 I thus propose to integrate sequencing-based metatranscriptomics in which total RNA (a proxy for gene activity) is extracted from microbial community, converted to cDNA and sequenced without the need for cloning. This will provide information on the regulation and expression profiles of complex communities by enabling quantitative measurements of dynamic expression of RNA molecules and their variation between different states reflecting the genes that are being actively expressed at any given time. However, the story is still far from complete, as we do not have direct evidence of the metabolism within a cell. To give a more complete picture of living organisms, I will integrate metabolomics which will provide unique chemical fingerprints that are a function of specific cellular activity. In particular, the focus will be on identifying habitat-specific endogenous and exogenous metabolites along distinct geochemical conditions. These metabolites will be detected using two-dimensional gas chromatography coupled with mass spectrometry. They will be related to the expression levels from transcriptomes using information on metabolic pathways readily available from annotating metagenomic sequences. 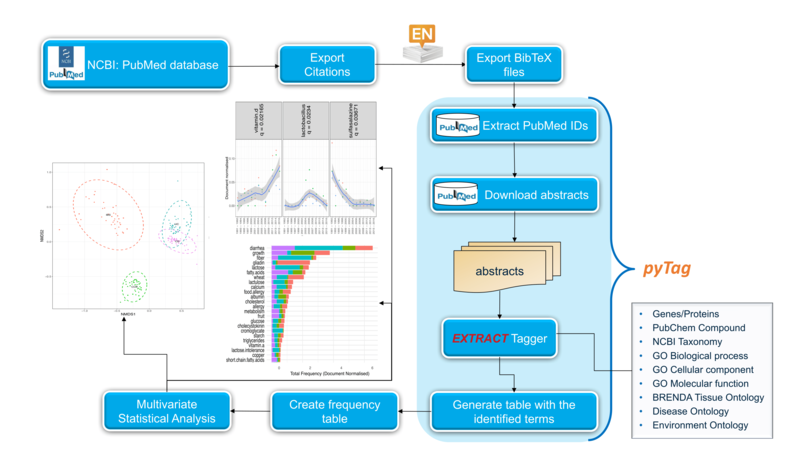 In this way we will integrate all three sources of information, mapping the metatranscriptome onto the assembled annotated metagenomes and reconciling the reconstructed metabolic pathways with observations on metabolite concentrations and fluxes. From this we will be able to predict the metabolic function of the entire community not simply who is there. Arctic sea ice decline is the exponent of the rapidly transforming Arctic climate. The ensuing local and global implications can be understood by studying past climate transitions, yet few methods are available to examine past Arctic sea ice cover, severely restricting our understanding of sea ice in the climate system. This project develops and apply a novel sea ice proxy that exploits genetic information stored in marine sediments, sedimentary ancient DNA (sedaDNA). This innovation uses the genetic signature of phytoplankton communities from surface waters and sea ice as it gets stored in sediments. This wealth of information has not been explored before for reconstructing sea ice conditions. Preliminary results from my cross-disciplinary team indicate that our unconventional approach can provide a detailed, qualitative account of past sea ice ecosystems and quantitative estimates of sea ice parameters. We will address fundamental questions about past Arctic sea ice variability on different timescales, information essential to provide a framework upon which to assess the ecological and socio-economic consequences of a changing Arctic. This new proxy is not limited to sea ice research and can transform the field of paleoceanography. Media coverage: Ancient DNA as a new tool for past climate change, November 29, 2018. Sea ice cover is a "canary in the coal mine" for the Arctic and global climate state. Sea ice extent is rapidly decreasing and Arctic summers are predicted to be sea-ice free by 2050. Because sea ice is crucial for sustaining local Arctic communities, international ecosystem services and biological diversity, there is an urgent need to understand variability in sea ice cover over longer time scales. Our best tool to predict future sea ice coverage is to understand past trends. Research activities investigating past natural variability in sea ice extent rely on microfossils and/or organic biomarkers produced by organisms that are associated with sea ice. Both methods have inherent assumptions and limitations, which make sea ice reconstructions non-trivial. To improve our understanding of sea ice history in the recent geological past, with special attention to rapid climate change events (e.g. 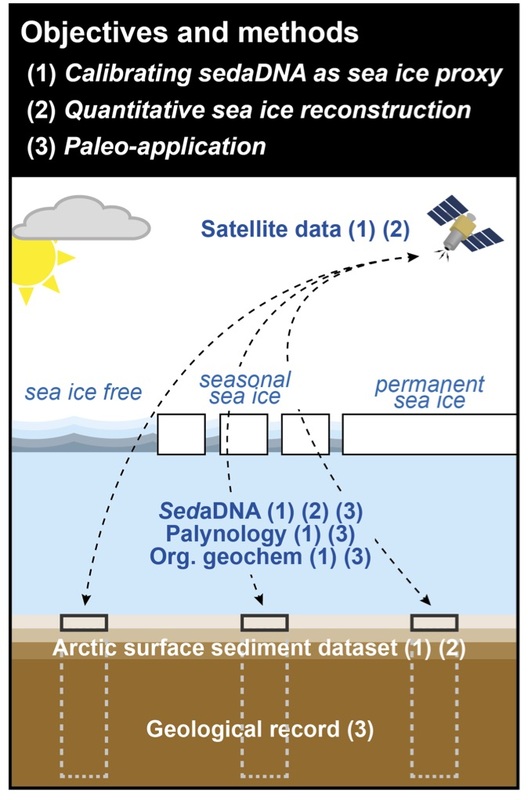 Daansgaard-Oeschger cycles, Heinrich events), we propose to develop a new proxy for determining past sea ice cover using environmental ancient DNA (aDNA) from Arctic sediments. Gastric cancer is a common and life threatening malignancy and most cases develop as a consequence of chronic Helicobacter pylori infection. Cancers of the stomach arise via a series of premalignant stages, including gastric atrophy. This latter condition is characterised by a loss of acid-secreting parietal cells, which results in elevated gastric pH (hypochlorhydria). Recent murine studies have suggested that additional microorganisms colonise the stomach when acid secretion is impaired and that these bacteria act as cofactors to promote the development of gastric cancer. However, other conditions which are associated with reduced gastric acid secretion, such as longterm acid suppressing drug use are not associated with gastric cancer development in the same way. We therefore hypothesise that specific changes occur in the gastric microbiome in association with H. pylori associated gastric atrophy and that these act as cofactors to promote gastric cancer development in susceptible individuals. We propose to investigate the gastric microbiome using 16S rDNA sequencing in a well established and validated transgenic mouse model in which gastric cancer develops as a result of chronic Helicobacter infection. In addition we will analyse the microbiome present in gastric biopsy samples that have already been collected from well characterised cohorts of human patients who have reduced gastric acid production due to a variety of causes (H. pylori infection, medication or autoimmune). We anticipate that these studies will lead to the development of specific microbial biomarkers that are associated with gastric cancer development. These may have future clinical utility for relatively non-invasive screening of individuals who are susceptible to developing gastric cancer. In addition, we will test the efficacy of one antibiotic and one probiotic strategy (the details of which will be determined by the results of our sequencing studies) for reducing susceptibility to Helicobacter-induced gastric cancer in mice. Do gut bacteria have a role in the aetiology of type 2 diabetes? European Foundation for the study of Diabetes ISRCTN07813749. PI: Dr Denise Robertson Collaborator: UZ Ijaz. 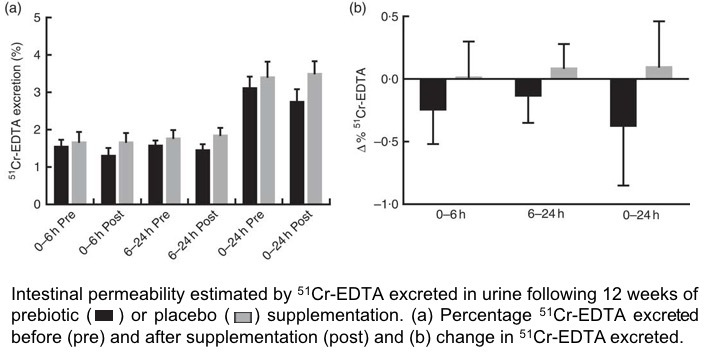 The main objectives of this study are to assess whether: colonic microflora, intestinal permeability, and endotoxaemia (plasma levels of lipopolysaccharide) in patients with type 2 diabetes differ from those of matched obese and lean subjects; and manipulation of colonic microflora with prebiotic carbohydrate supplement improves glucose tolerance via improvements in intestinal permeability and endotoxaemia. 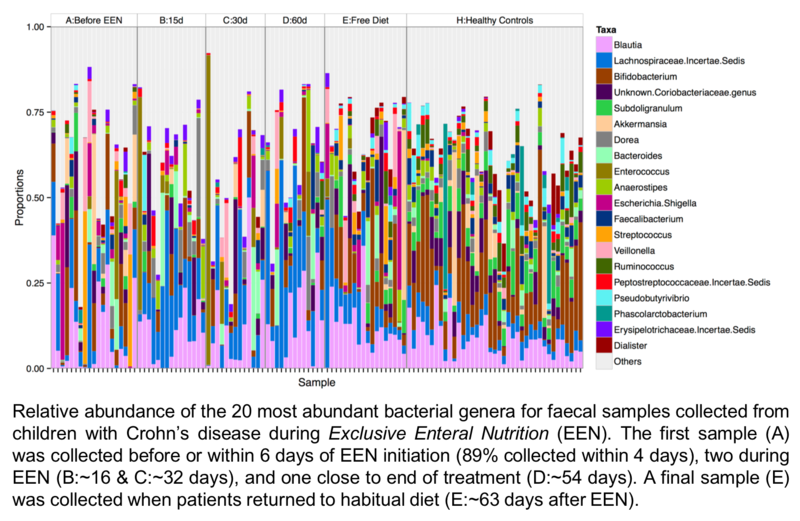 Characterisation of Gut Microbial Taxonomy and Functionality using Next Generation Sequencing in Children with Crohn's Disease during Exclusive Enteral Nutrition. Crohn's in Childhood Research Association (2013 - 2014). PI: Dr Konstanitonos Gerasimidis. £34,700 - Research Fellow - Acknowledgement: I received 3 months of my salary from this grant in 2014 before I started my NERC fellowship. Development of instrumental and bioinformatic pipelines to accelerate commercial applications of metagenomics approaches, Innovate UK (2012 - 2014). PI: Yvette Visser (Unilever Plc). 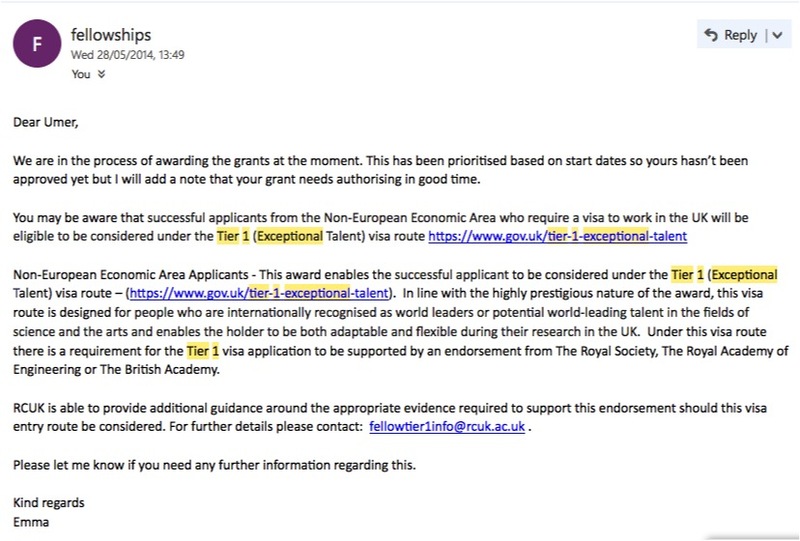 £2,300,000 (To Glasgow: £284,030) - Research Fellow - Acknowledgement: I received salary from this grant between 2012 and 2014. I worked on a project that investigated methods to infer time-varying networks from multiple time signals (slides). The time signals pertain to Google trends, Twitter feeds, stock prices, exchange rates, commodity prices, weather statistics and transport statistics. 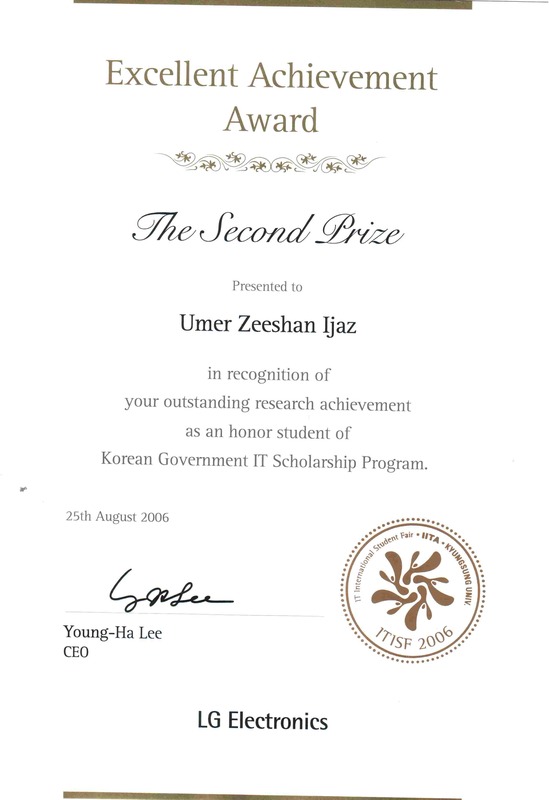 My responsibilities were: established a template of usage requirements from relevant stakeholders in UK government and other beneficiaries; worked on housing datasets in collaboration with Institute of Public Policy Research and Rightmove; identification of unusual behaviour in single signals, in particular weak signal changes that are distributed across many variables but causing global changes in network topology; detrending the data to remove seasonal or periodic components, and irregular fluctuation; forecasting of future values of individual signals using Gaussian Processes based regression; constructed a hierarchy of increasingly sophisticated methods for network inference; it is particularly important that we establish which of the wide range of available methods is most appropriate for the data we have and that we infer plausible networks of relations. I considered simple correlations with sliding windows; a range of causal methods such as Dynamic Bayesian Networks and Granger Causality; those that are based on Markov Random Field (Eric Xing's work at Carnegie Mellon), and some that are based on State-Space Models (Zoubin Ghahramani's work at Cambridge); and identification of high trending keywords from Google Trends Datasets using residual time series obtained from the difference between the linearly interpolated values and original values and by using various outlier detection methods; and developed a cross-platform prototype software tool GlobalView in C++ for dynamic network inference. I developed a Hybrid 3D Ultrasonic Imaging System. The project focused on: tracking the trajectory of a 3D ultrasound probe based on the image-based registration of acquired data and the output of an inertial position sensor; calibration of the hybrid system; correction of artifacts in the data caused by variations of the pressure from the probe during the scan; differentiation of backscatter into diffuse and directional components using the overlap data from multiple scans; and development and evaluation of software tools to enable the system to be used effectively in a Hospital environment. The system was implemented in Stradwin software (written in C++ and using wxWidgets to provide cross-platform compatibility and OpenGL for 3D visualisation). The software was then modified to run on a mobile ultrasound machine Ultrasonix Sonix RP; and to communicate with the inertial sensor through it's serial port. The software was also modified to provide a calibration protocol to compensate for the orientation in which the sensor, Intersense Inertia Cube 3, was mounted on the ultrasound probe. Additionally, the keypad controls for the ultrasound machine were fully integrated with the developed software. This has made the data acquisition process easy for clinicians as they can hold the 3D probe with one hand and with other hand can click on the keypad to acquire the volumetric data. The system was then shipped to Addenbrookes' Hospital, Cambridge, where it successfully completed the review by the ethics committee. It was then used by a clinician to explore the range of applications in which this type of scanner could offer particular benefit. As a proof of concept we have carried out a feasibility study recruiting pregnant women attending for routine obstetric ultrasound scans and have obtained promising results (77% to 83% reliability in clinical trials). 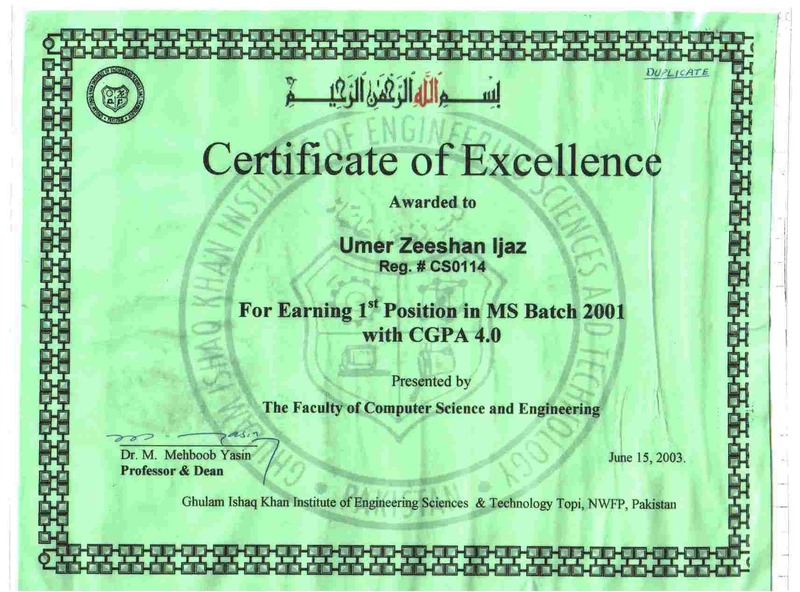 During my PhD (2004-2008), I focused primarily on the development of static and dynamic algorithms for inverse problems that arise in a variety of engineering applications including but not limited to electrical impedance tomography (EIT). 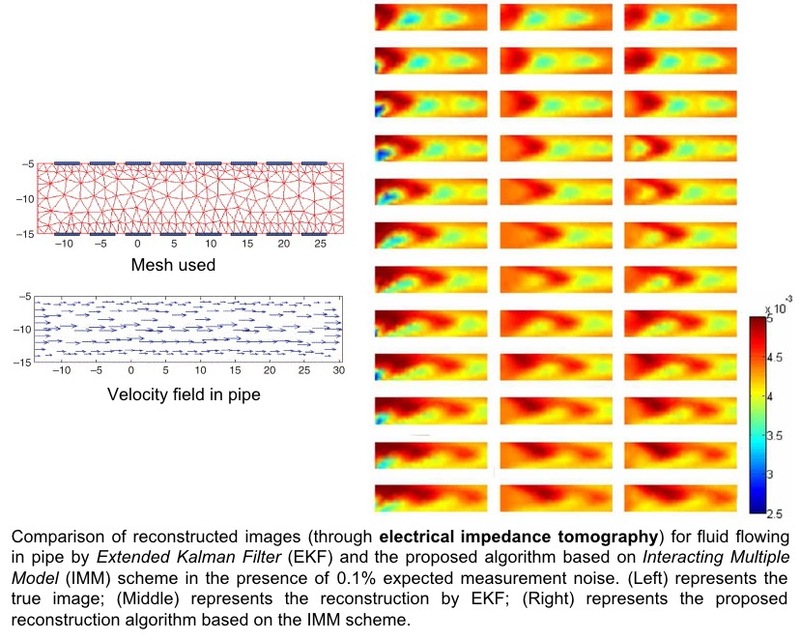 I developed novel tomographic imaging methods using EIT to manipulate measurement data from electrodes attached to the surface of a pipeline in order to estimate the multidimensional distribution of physical parameters inside. As compared to the traditional EIT, those scenarios were considered in which the object to be imaged is changing very rapidly during the data acquisition; necessitating a desire for reasonable spatio-temporal resolution. 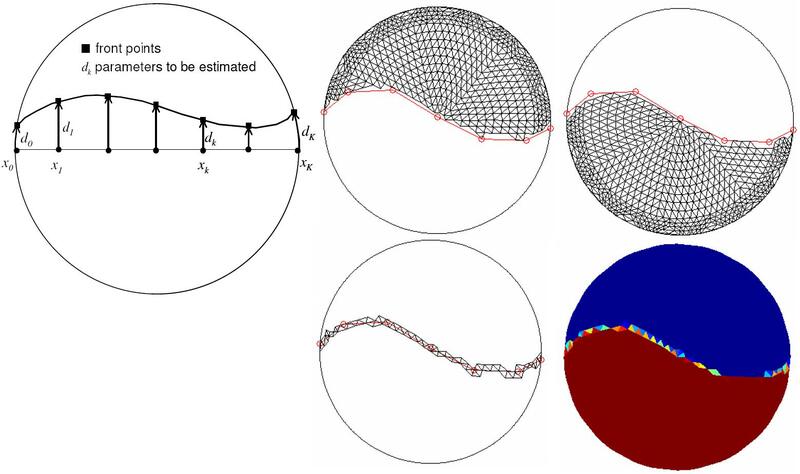 Rather than considering the inverse problem as a traditional tomography reconstruction problem, the problem was formulated as a state estimation problem utilising different kinematic evolution models for the physical parameters along with an observation model based on finite element analysis (FEM). In particular, the Kalman-type inverse algorithms were developed for estimation of time-varying interfacial boundary in stratified flows of immiscible liquids (targeting liquid hydrocarbon transportation in pipelines that often contain free water). Concentration distribution estimation of fluid using electrical impedance tomography: In this research, the problem of imaging the concentration distribution (by modelling as a stochastic convection-diffusion equation) of a given substance moving in a strong electrolyte in a pipeline is considered. 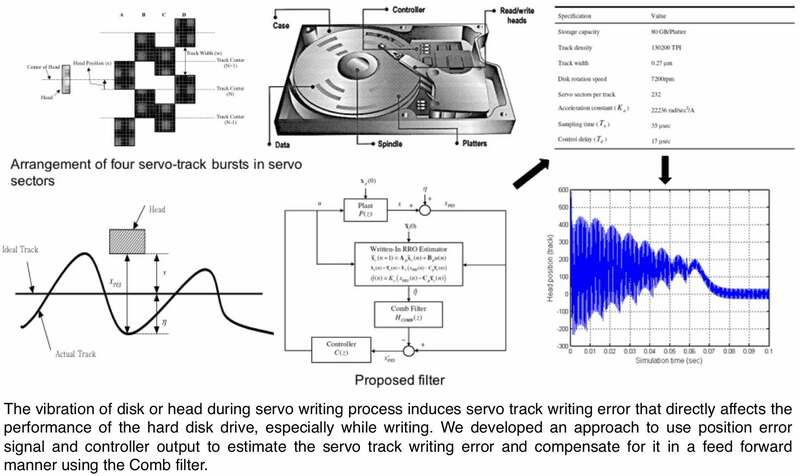 Servo track writing error estimation in hard disks: The vibration of disk or head during servo writing proess induces servo track writing error that directly affects the performance of the hard disk drive, especially while writing. We developed an approach to use position error signal and controller output to estimate the servo track writing error and compensate for it in a feed forward manner using Comb filter. 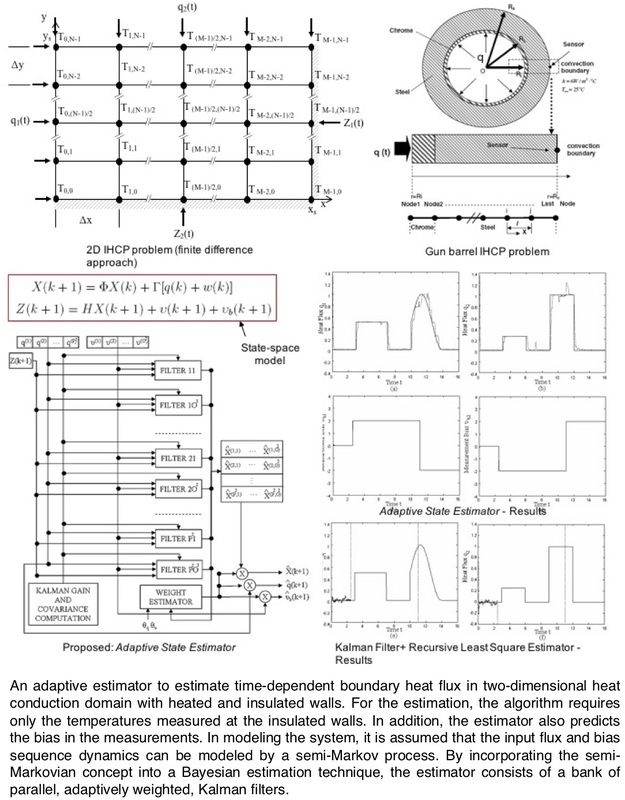 Adaptive state estimator for Inverse Heat Conduction Problems (IHCP): I developed the adaptive estimator to estimate time-dependent boundary heat flux in two-dimensional heat conduction domain with heated and insulated walls. For the estimation, the algorithm requires only the temperatures measured at the insulated walls. In addition, the estimator also predicts the bias in the measurements. In modeling the system, it is assumed that the input flux and bias sequence dynamics can be modeled by a semi-Markov process. By incorporating the semi-Markovian concept into a Bayesian estimation technique, the estimator consists of a bank of parallel, adaptively weighted, Kalman filters. 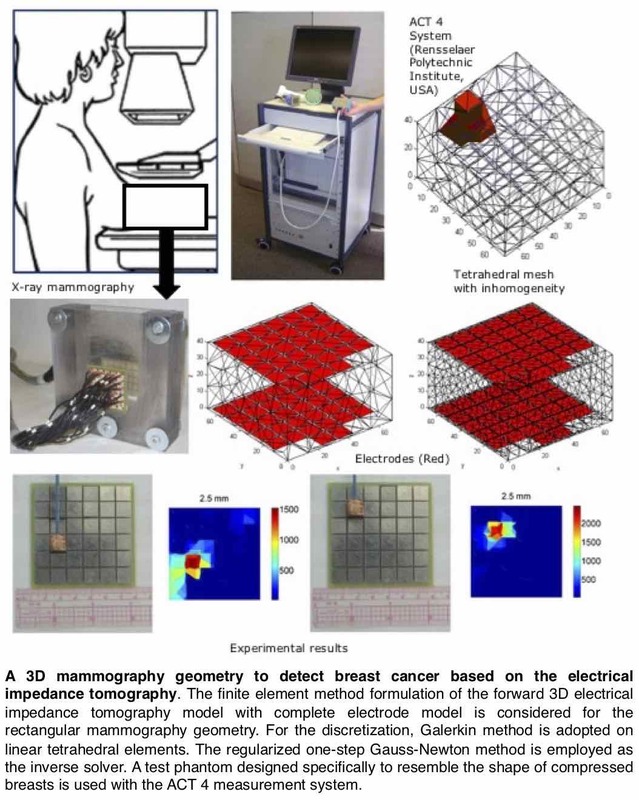 Mammography phantom studies using 3D electrical impedance tomography: In this study, we considered a 3D mammography geometry to detect breast cancer based on the electrical impedance tomography. The finite element method formulation of the forward 3D electrical impedance tomography model with complete electrode model is considered for the rectangular mammography geometry. For the discretization, Galerkin method is adopted on linear tetrahedral elements. The regularized one-step Gauss-Newton method is employed as the inverse solver. A test phantom designed specifically to resemble the shape of compressed breasts is used with the ACT 4 measurement system. 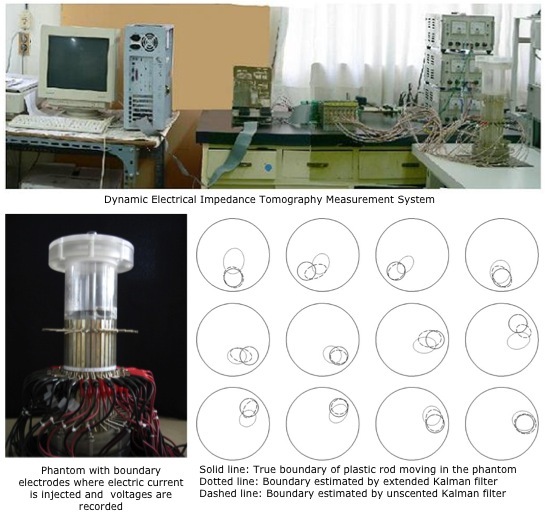 Tracking moving interfacial boundary in sedimentation process using 3D electrical impedance tomography: The monitoring of solid-fluid suspensions under the influence of gravity is widely used in industrial processes. By considering sedimentation layers with different electrical properties, non-invasive methods such as electrical impedance tomography can be used to estimate the settling curves and velocities. 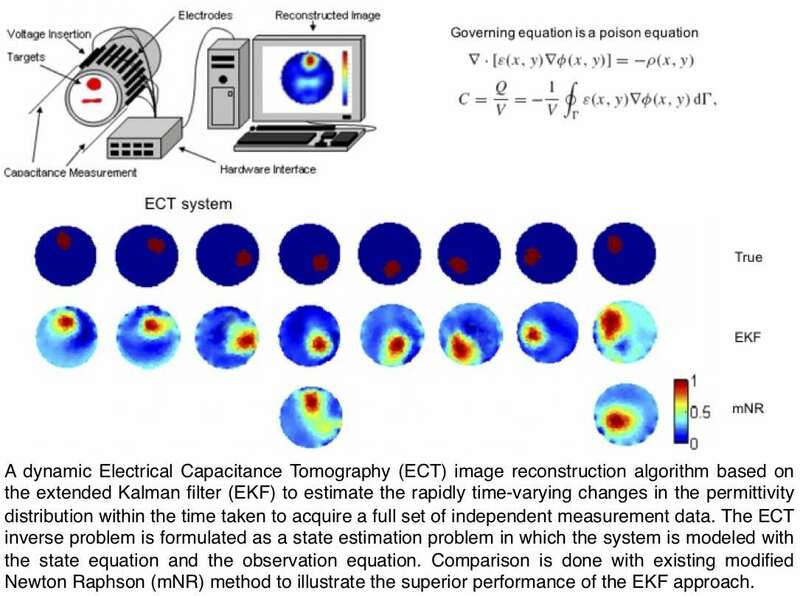 Dynamic process monitoring using electrical capacitance tomography:We propose a dynamic Electrical Capacitance Tomography (ECT) image reconstruction algorithm based on the extended Kalman filter (EKF) to estimate the rapidly time-varying changes in the permittivity distribution within the time taken to acquire a full set of independent measurement data. The ECT inverse problem is formulated as a state estimation problem in which the system is modeled with the state equation and the observation equation. Comparison is done with existing modified Newton Raphson (mNR) method to illustrate the superior performance of the EKF approach. A spot detection and comparison using random sample consensus algorithm (RANSAC) in simple correlation and monogenic phase correlation. 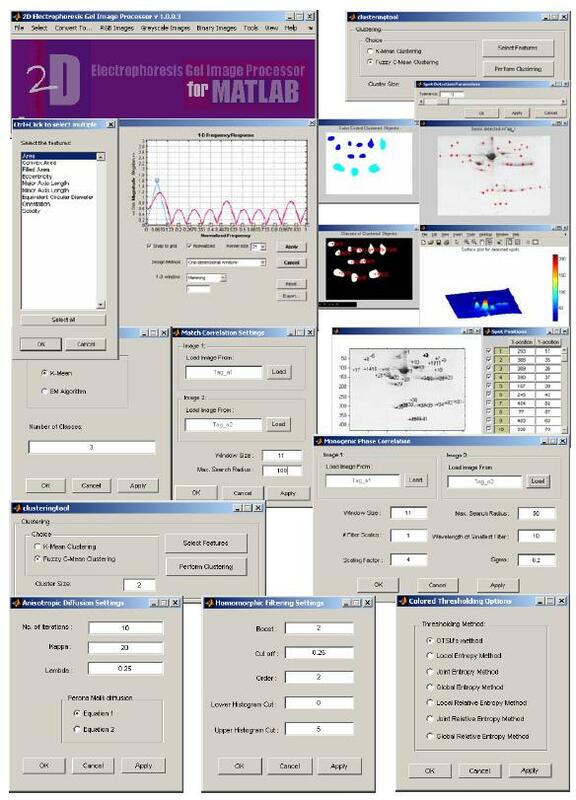 A shape clustering tool that uses k-means and Fuzzy C-means clustering algorithm. A segmentation tool using k-means and an expectation maximization (EM) algorithm. Visitor to Environmental'Omics Lab 2014; On his PhD thesis (2014) entitled "Gut microbiota in obesity of different aetiology: cause or effect?" On his PhD thesis (2015) entitled "Developing a nutrient recovery process for recovering nutrients in anaerobic digestate in low income countries"
On her PhD thesis (2016) entitled "Ecology, physiology and performance in high-rate anaerobic digestion"
Visitor to Environmental'Omics Lab 2014; On her PhD thesis (2016) entitled "Investigation of microbial community structure and function underpinning grass and food waste anaerobic digestion"
On her PhD thesis (2017) entitled "Towards a predictive framework for microbial management in drinking water systems"
Visitor to Environmental'Omics Lab 2016; On her PhD thesis (2016) entitled "The EU-protected slug Geomalacus maculosus: an investigation into its phylogenetics, population densities in conifer plantations and its gut microbial community"
Visitor to Environmental'Omics Lab 2017; On his PhD thesis (2018) entitled "A Large Scale Metagenomic Analysis of the Faecal Microbiota in Preterm Infants Developing Necrotising Enterocolitis"
Visitor to Environmental'Omics Lab 2017; On his PhD thesis (2017) entitled "Taxonomy, parataxonomy, and metabarcoding: an investigation of invertebrate diversity in high nature value wet grasslands"
Does subsampling improve assembly quality for very high coverage datasets when using Velvet without removing noise from reads? 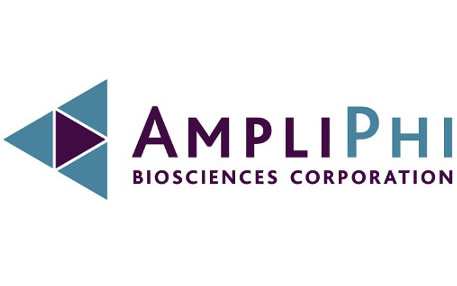 NanoAmpli-Seq: A workflow for amplicon sequencing from mixed microbial communities on the nanopore sequencing platform. 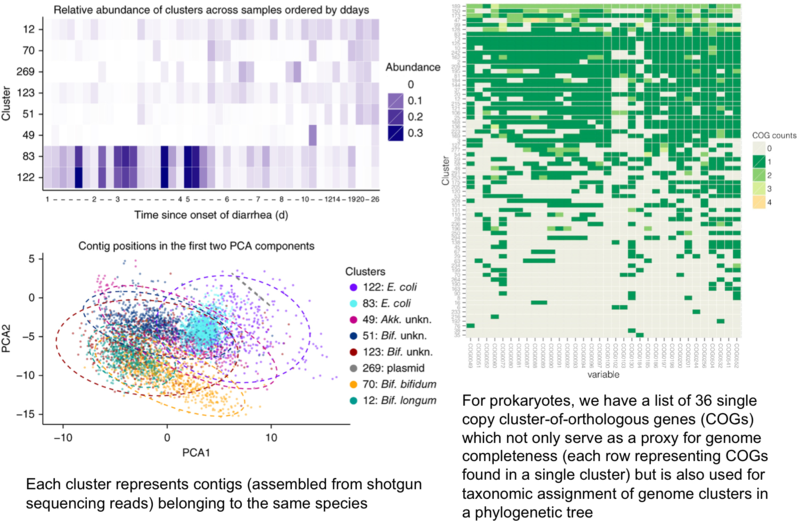 microbiomeSeq (Ongoing project; Designed with Alfred Ssekagiri): An R Package for multivarite statistical analysis of microbial community analysis in an environmental context. RvLab (with collaborators at HCMR, Greece) makes use of R which is a statistical processing environment widely used by scientists working in many biodiversity related disciplines. It supports an integrated and optimized (in respect to computational speed-up and data manipulation) online R environment. This vLab tackles common problems faced by R users, such as severe computational power deficit. Many of the routines operating under the R environment, such as the calculation of several biodiversity indices and the running of the multivariate analyses, are often of high computational demand and cannot deliver a result when the respective datasets are in the form of large matrices. CONCOCT: A software for binning metagenomic contigs with coverage and composition. 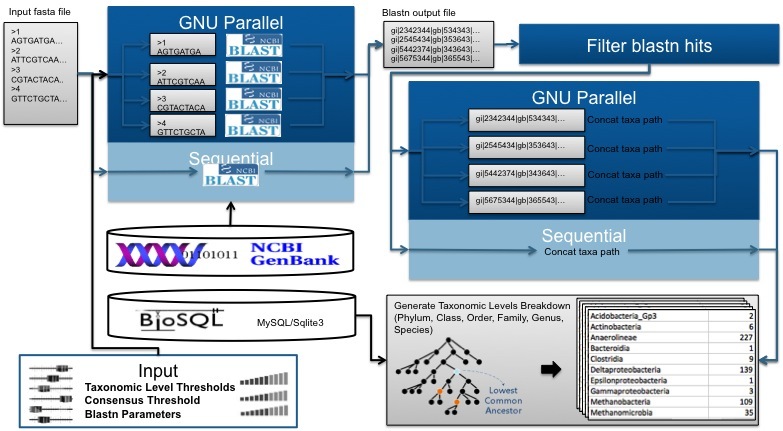 CViewer (Ongoing project; Designed by Orges Koci): A Java-based integrated analysis toolkit for whole genome shotgun metagenomics and other meta'omics technologies. pyTag (Ongoing project; Designed by Orges Koci): A tool for identification and analyses of ontological terms in application area specific literature surveys. 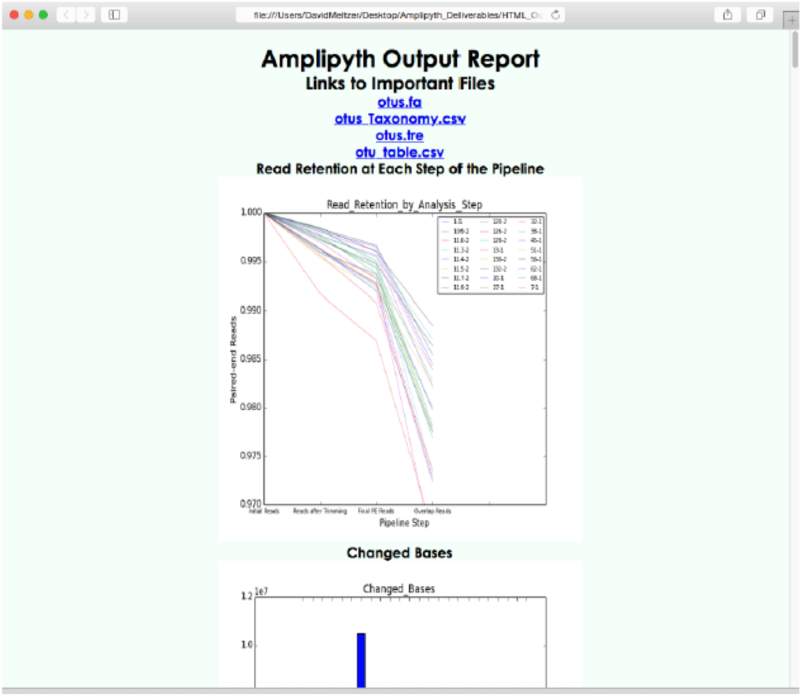 AmpliPyth (Ongoing project; Designed by David Meltzer): Python-based pipeline that processes metagenomic amplicons (16S rRNA/18S rRNA and Fungal ITS) and generates an HTML report. 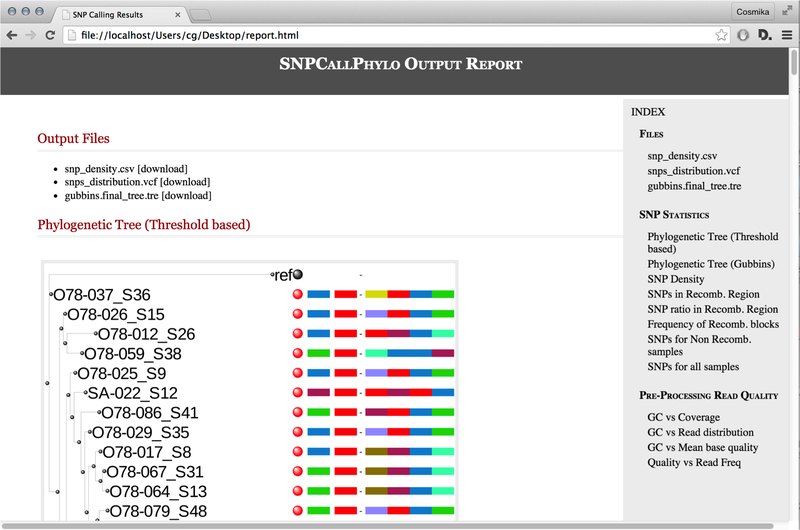 SNPCallPHYLO (Ongoing project; Designed by Dr Cosmika Goswami): Python-based SNPs calling pipeline that processes whole genome shotgun sequencing data from single genome isolates and generates an HTML report. 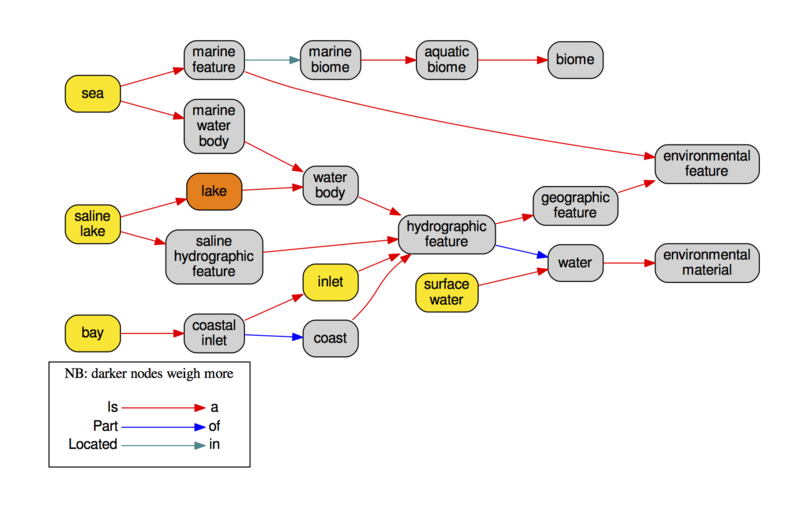 NMGS: A software for fitting the Unified Neutral Theory of Biodiversity with Hierarchical Dirichlet Process. 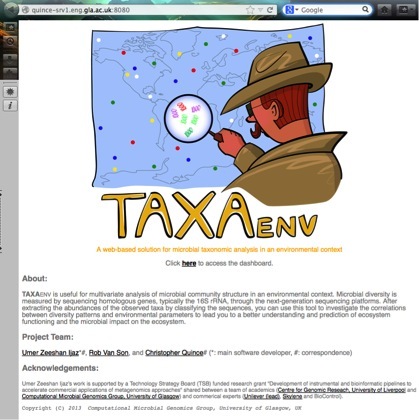 TAXAenv: A website useful for multivariate statistical analysis of microbial community structure (abundance tables) in an environmental context (metadata). TAXAassign: A bash based pipeline for generating taxonomic prifles using NCBI's Taxonomy. CLUSThack: A python package that has an embarassingly-parallel (multithreaded + utilises streaming SIMD extensions) implemention for qgram-based edit distance measurement and is useful for hierarchical clustering of 16S rRNA sequences. Test files: hclust.py, test.fasta, test.pdf. 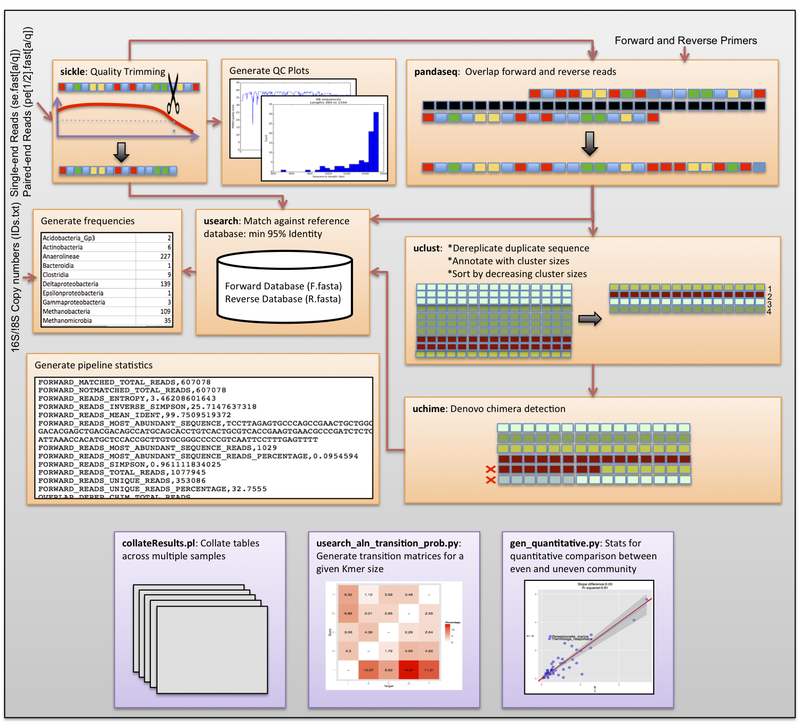 seqenv: A pipeline capable of annotating genetic sequences with Environmental Ontology. 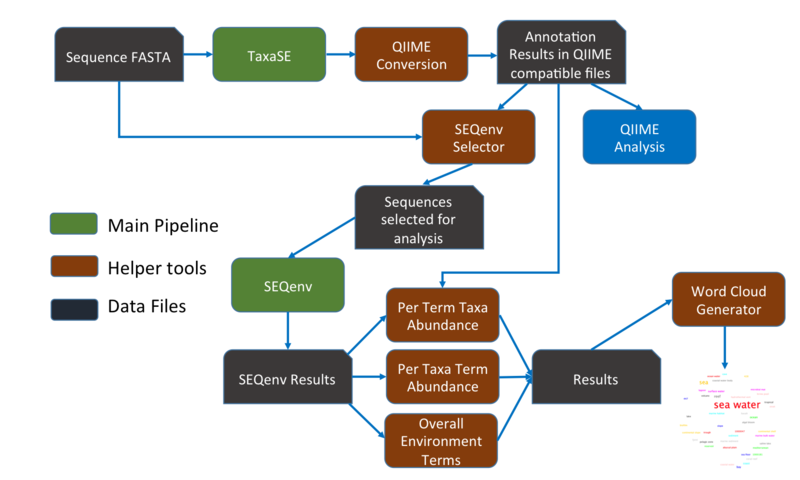 SeqEnv-Ext (Designed by Dr Ali Z. Ijaz): A taxa-centric extension to seqenv pipeline, which consisted of two parts, each providing environmental annotations under different context, with first part providing taxon abundance on a per term basis while the second part lists environmental term abundance under a per taxon context. A separately developed program that required the use of the original seqenv pipeline, this enabled two different methods of viewing environmental annotations, which significantly augments the analysis capability of the pipeline. PHYLOmap: A software for drawing heatmaps with phylogenetic trees from metagenomic surveys based on Interactive Tree of Life (ITOL) API. 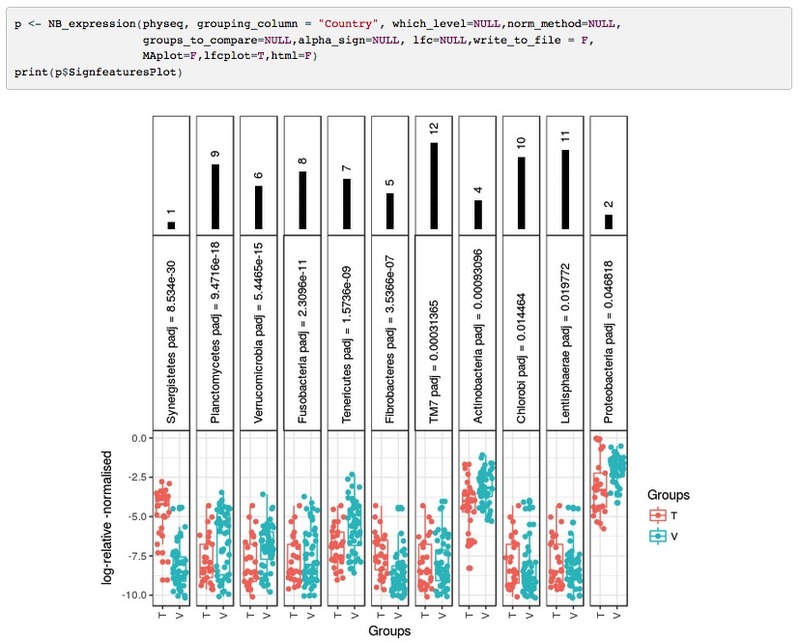 SUMMARIZEplot: Web-based interactive stacked barplot viewer (programmed using D3) for abundance tables. PHYLObar: Web-based interactive viewer (programmed using D3) for trees in Newick format. clust_validity.R: This script takes a CSV file of N D-dimensional features, performs K-means or dp-means clustering and chooses the optimum number of clusters based on either of the implemented internal clustering validation indices. Additionally, if the csv file contains a column titled "True_Clusters" containing true clusters membership for each object, you can use it to validate clustering performance using several external clustering indices. GraphicalLasso.tar.gz: Generates network of associations between OTUs as a DOT file which can then be visualised in GraphViz. Faster blastn searches using GNUparallel: For an Illumina dataset with 6 million reads, blastn_parallel.sh took 2.5 minutes on 45 cores as compared to blastn.sh which took 86 minutes. Extracting representative sequences from OTU clusters generated in AmpliconNoise. extract_clust_seqs_fasta.pl is an extension of AmpliconNoise's Typical.pl and can give the most abundant sequence, consensus sequence, first sequence, and the longest sequence of each cluster as representative OTU. remove_colinear_terms.R: An R script to iteratively remove colinear variables by calculating step-wise Variance Inflation Factor (VIF) of terms (columns) in a CSV file. convIDs.pl : This script takes a (TAB/COMMA) delimited file and converts words in a particular column to those provided by a COMMA delimited IDs list. collate_CSV.R: This R script takes two frequency tables in CSV format and collates them together by either taking union or intersection of columns. 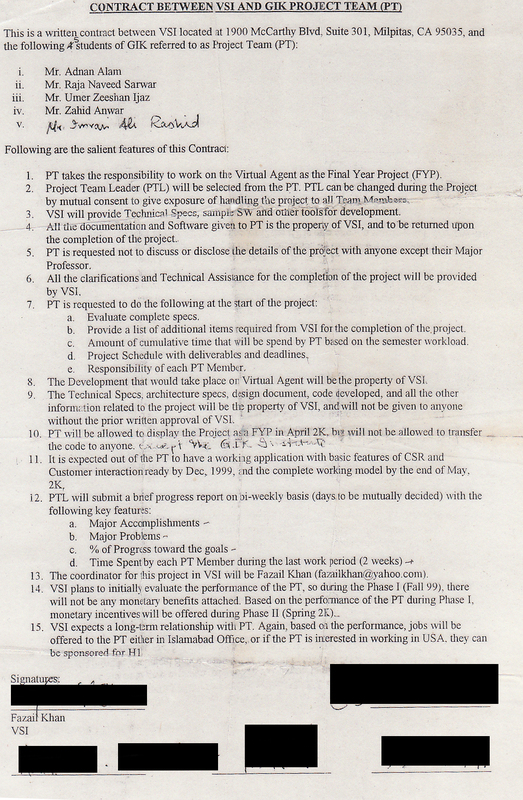 Furthermore it inserts "F1_" and "F2_" as prefixes to rownames of both CSV files, respectively. collateResults.pl: This script is useful for combining CSV files generated by TAXAassign, AMPLICONprocessing or any software that produces two-column CSV files without header information. It takes as an input the path to a main folder where subfolders contain CSV files, each matching a particular pattern in their names. collateGCMSResults.pl: This script is useful for collating data generated from GC-MS machines. 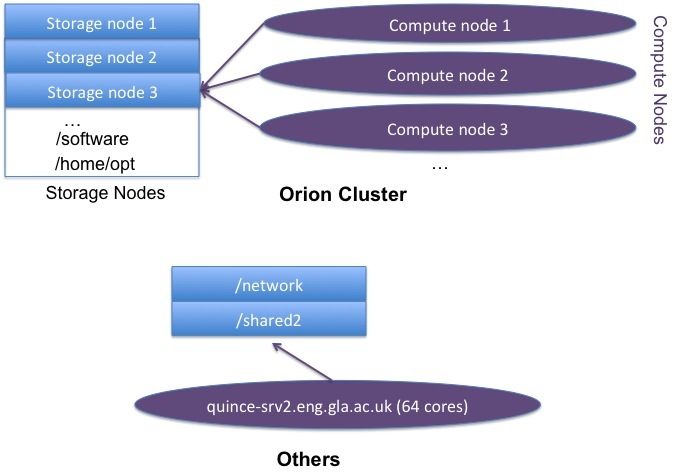 At the heart of my research lab is a bioinformatics cluster called Orion that I regularly administer and that run the workflows and the software I develop in collaboration with my colleagues as well as the most frequently used third-party software. Note: In-kind refers to top-up money from grants where I am not involved directly/not listed as an investigator. These are the nodes that you login to using ssh -Y [USER]@[NODE].eng.gla.ac.uk. Please note that due to security reason, Orion cluster is only accessible through University of Glasgow VPN (install the client from this link). Those with Windows machines can use MobaXterm as a telnet client. To upload/download the data to/from Orion, use Cyberduck for FTP/SFTP. EPSRC EP/I005986/1 "IDEAS Factory - Global View"
EPSRC EP/F016476/1 "Hybrid Three-Dimensional Ultrasound"
Main project was a Website Link Filtering and Review System with the Portal Frontend (Search Engine) and the Portal Website Database Maintenance System called (similar to modern day Google). 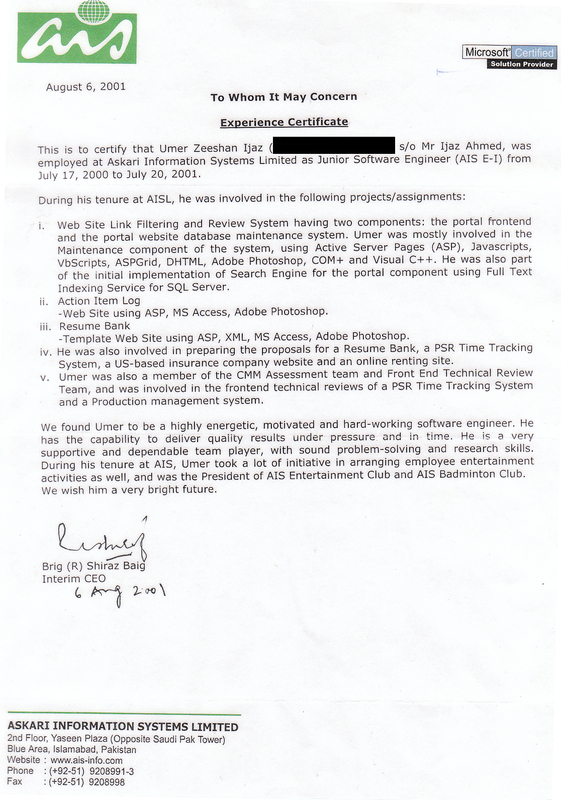 Launched back in 09/04/2002, the Fast Scout Portal contained a sophisticated search engine linked to a structured classification list with over 16,000 business related categories covering all major business topics (with nearly a million pages indexed). It was active until 2005 or thereabouts. EBioMedicine, accepted for publication (2019). Response to Kaakoush et al. American Journal of Gastroenterology, 111(7):1033-1034, 2016. [P38] B Torondel, JHJ Ensink, O Gundogdu, UZ Ijaz, J Parkhill, F Abdelahi, V-A Nguyen, S Sudgen, W Gibson, AW Walker, and C Quince. In TDWG 2014 Annual Conference, Jönköping, Sweden, October 27-31, 2014. In 5th International Clostridum Difficile Symposium, May 19-21, 2015, Bled, Slovenia. Proceedings of the Nutrition Society, 74(OCE1):E75, 2015. Environmental Microbiology. 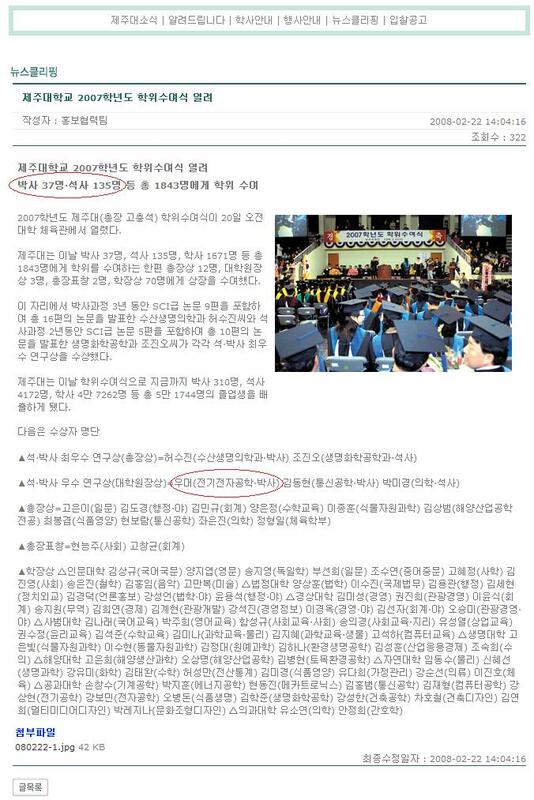 doi: 10.1111/1462-2920.12886, 2015. Proceedings of the IEEE, 105(3):516-529, 2017. Journal of Crohn's and Colitis, 8(Supplement 2):S393-S394, 2014. [P26] UZ Ijaz, RJ Housden, GM Treece, RW Prager, and AH Gee. Journal of Ultrasound in Medicine, 32(4):699-714, April 2013. [P25] E Dyer, UZ Ijaz, RJ Housden, RW Prager, AH Gee, and GM Treece. British Journal of Radiology, 85: e919-e924, October 2012. Measurement Science and Technology, 21(8): 085803 (17pp), July 2010. 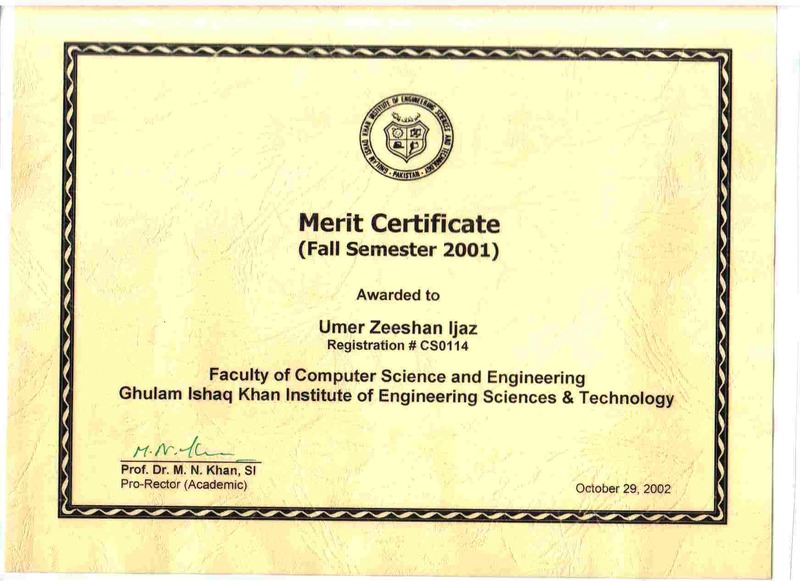 Proceedings of the Institution of Mechanical Engineers Part H-Journal of Engineering in Medicine, 224(2):193-223, 2010. Measurement Science and Technology, 21(3):035501 (13pp), March 2010. Journal of Computational Physics , 227(15):7089.7112, July 2008. 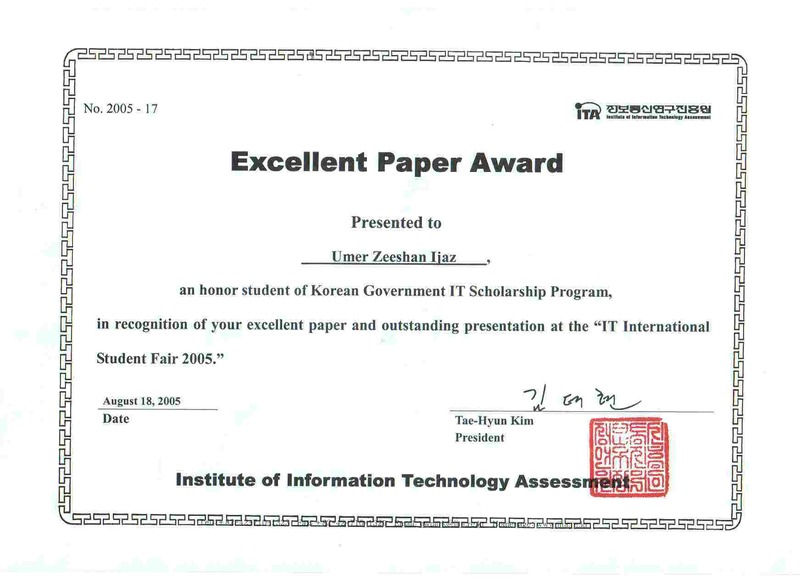 AIP Conference Proceedings, 914:896-901, 2007. 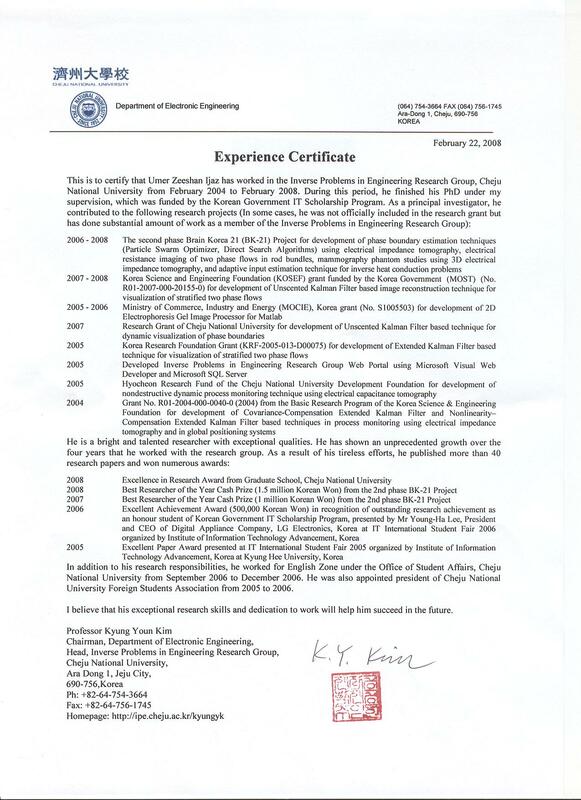 AIP Conference Proceedings, 914:844-849, 2007. Measurement Science and Technology, 18(1):62-70, January 2007. 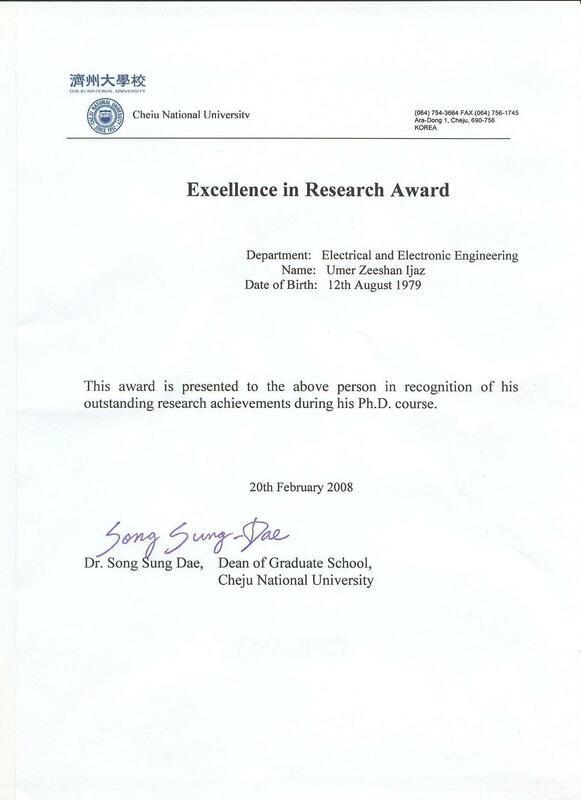 PhD thesis, Cheju National University, Korea, December 2007. Philosophical Transactions of The Royal Society A - Mathematical Physical and Engineering Sciences, 367:3095-3120, August 2009. Measurement Science and Technology, 19(6) 065501 (11pp), June 2008. Measurement Science and Technology, 18(5):1257-1269, May 2007. Measurement Science and Technology, 17(10):2731-2739, October 2006. 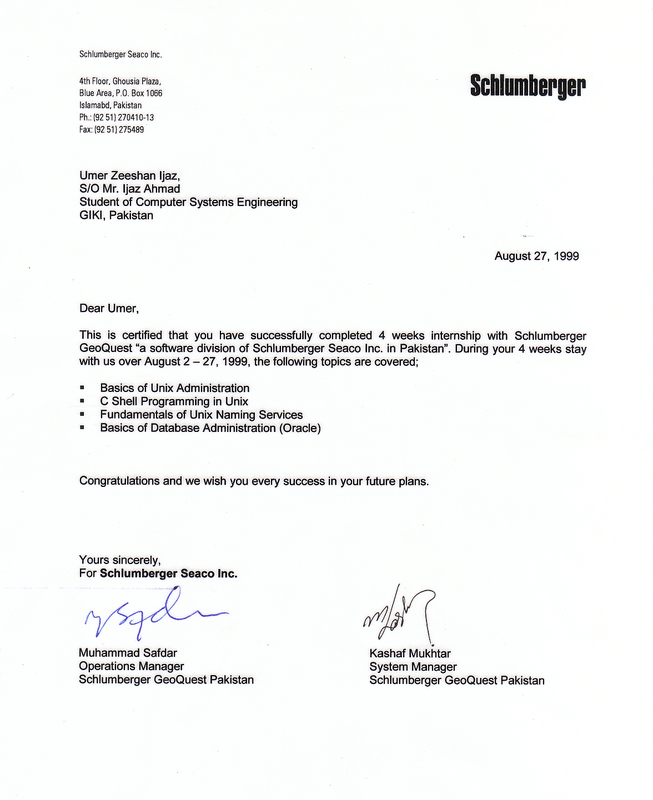 Flow Measurement and Instrumentation, 18(1):47-56, March 2007. 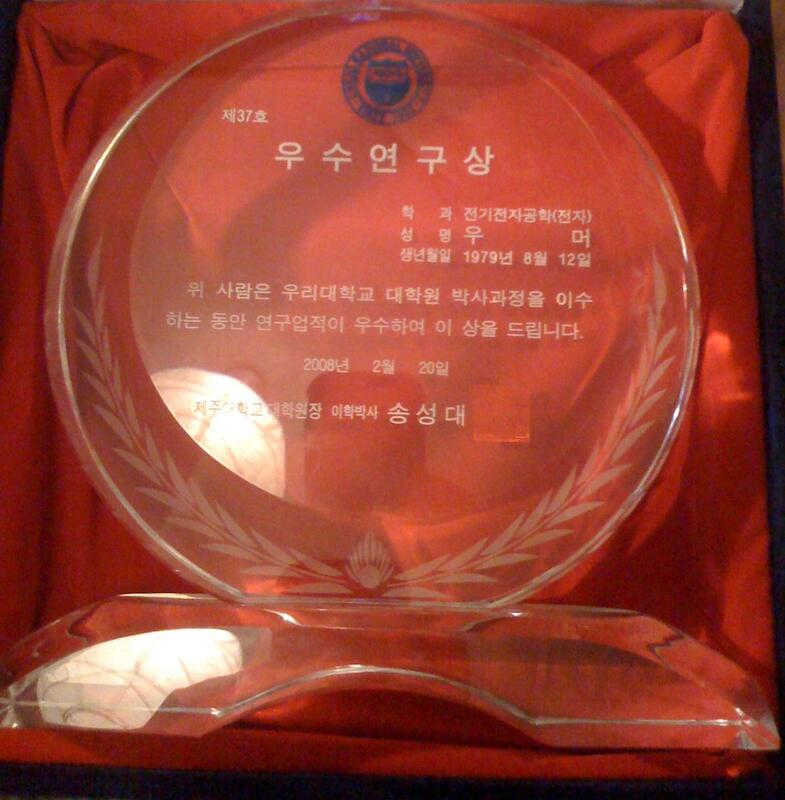 Journal of The Korean Physical Society, 54(4):1439-1447, April 2009. Measurement Science and Technology, 18(7):2092-2102, July 2007. 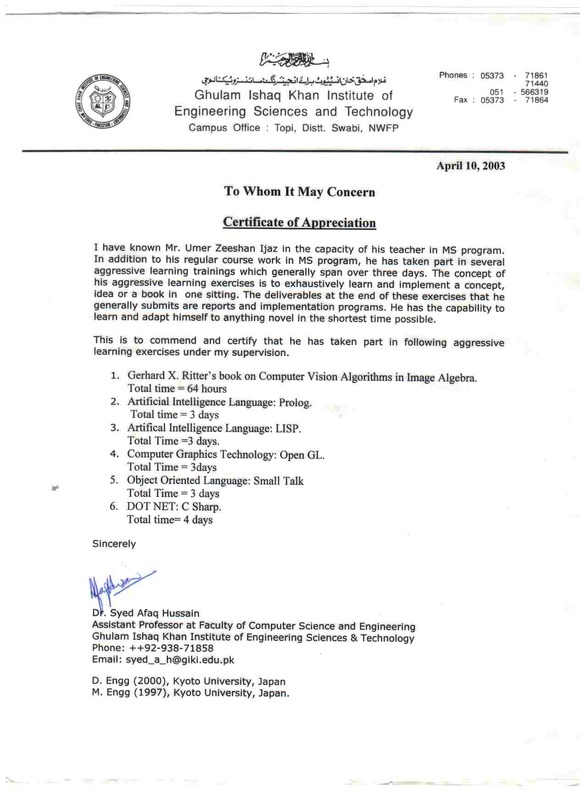 Lecture Notes in Computer Science, 3961:237-246, 2006. 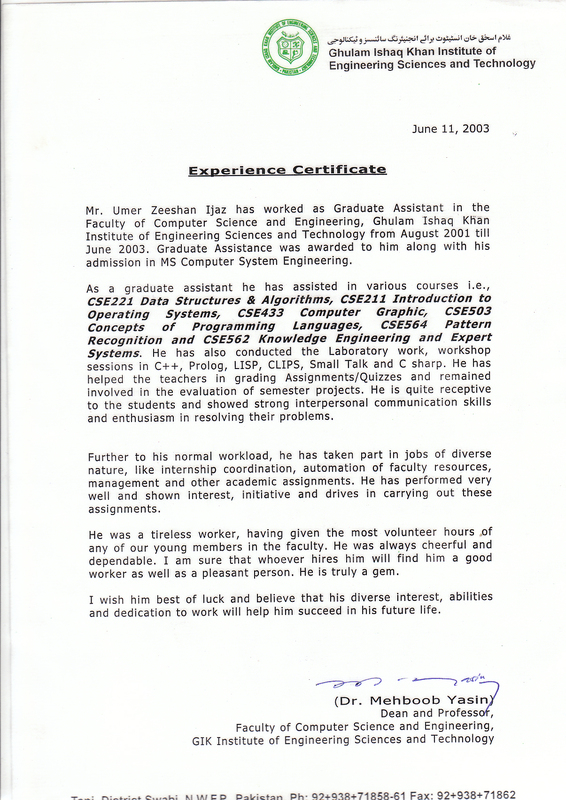 In 5th IEEE Conference on Sensors, 2006. Key Engineering Materials, 321-323(2):1671-1674, 2006.
International Journal of Heat and Mass Transfer, 50(21-22):4117-4130, October 2007. In ICHIT 2006, Jeju, Korea, November 9-11, 2006. 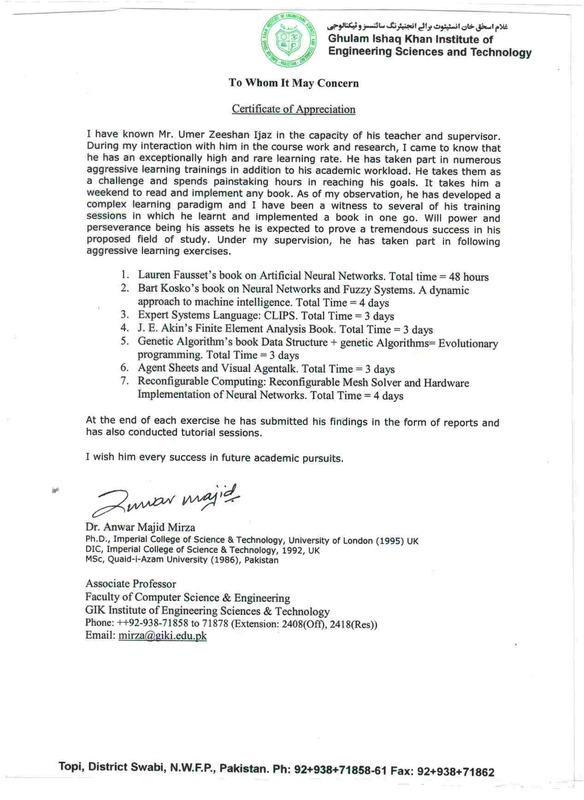 Last Updated by Dr Umer Zeeshan Ijaz on March, 2019.